Yeah, but: It does work. The Long Version: The Callpod Fueltank Uno (manf) is the mid-air refueling tanker of the smartphone world. It's a rechargeable battery with a port to charge it and a port to charge something else, with a few LEDs in between. The casing is an uninterrupted translucent grey plastic; the charge light and power level indicators shine through it with plenty of oomph. 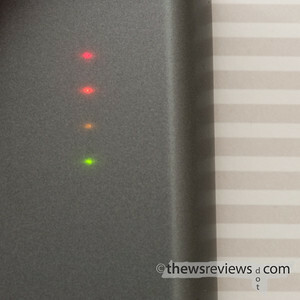 The point of the device is that it can be relied on to give a boost, or a full-dose recharge, to small devices that can't otherwise make it to a wall outlet, car charger, or other source of power. It can't help out something the size of a laptop, but with care, it can more than double the running time my Blackberry Bold 9000. 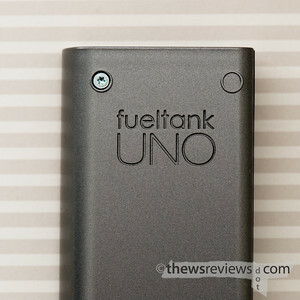 Callpod's Fueltank comes in two sizes, the Uno and Duo. The Duo has twice the capacity of the one that's named after the popular card game, but I picked the smaller one that's easier to carry. It will be enough to get me through a couple of days where I won't have guaranteed access to power, and because I'll never be in one place for very long I can't risk being without web access and my trusty GPS. For the past couple of weeks I've been testing the Fueltank, and it works well for what it says it does. It does a full charge without any problem, and if I don't leave it connected overnight, I can usually get a second charge out of it as well. That's plenty for a weekend away. Naturally, the Fueltank needs to be charged so that it can do its thing. It comes will a wall-wart adapter with a mini-USB cable permanently attached, which plugs into the port on the battery pack. While not all USB-style power supplies put out exactly the same power, I've never experienced any problems when I use them for different devices. (Caution: your milage may vary; your device may catch on fire.) So if I'm able to charge my fueltank, then I'm also able to charge my phone. There is a certain irony there, but being able to keep the booster fed from the same charger that handles everything else is a huge benefit for traveling. Three cables and one little power brick can handle my Blackberry, Penny's Palm Pre, our family of iPods, my portable photo hard drive, and the Callpod Fueltank. I love ubiquity and commonality - it makes life so much easier. And with that thought in mind, the happy part of my review ends right now. Turning the Fueltank over, we see the port it uses to charge other devices. 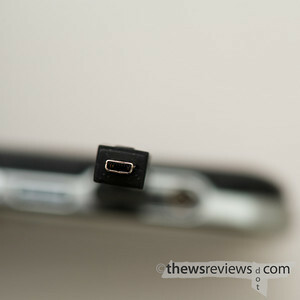 It's a proprietary 8-pin connector that looks like - but isn't quite - one of those tiny little micro-USB jacks. 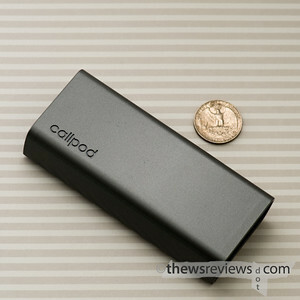 This means that the common cables that we all already have for our various devices won't work with the Callpod. So now we need to carry the cable to charge the devices directly as well as a second one to use the oh-so-handy backup battery. And if that unique cable gets lost, good luck finding it in stores. Best Buy - the store named after an expiration date - is the big retailer that sells Callpod products, but currently doesn't even list the little adapters on its website. They're only available directly through Callpod's web store. We'll get back to that in a minute, but first let's take a look at the adapter cable itself. This is one of the two cables that Callpod includes with the Fueltank Uno, with the standard mini-USB connector on the left and its nasty custom plug on the right. You might notice that it's labeled 'TOP' - to make it easier to insert into the nearly-symmetrical charging port - so it's clear that someone in the design team knew that they had a problem, but couldn't think of any other way to fix it. The result is lazy, sloppy, and inadequate. Using a custom and proprietary connection is fine if there's a good reason for it and it's well executed, but this has neither attribute in its favour. The connection itself is unreasonably difficult to use, even worse than the various USB plugs, and since Callpod chose this one all on their own it's completely their fault that it's so badly designed. Using a standard USB-A jack would remove a whole lot of the fine print from Callpod's claim that the Fueltank is "Compatible with 3,000+ Devices". 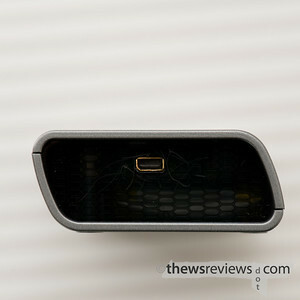 Two photos ago we saw the port that the adapter plugs into, and this is the business end of Callpod's chosen connector. Quick - which way does it go in? Now imagine having to plug it in in a dark hotel room, on a moving bus, or trying to connect it by feel in your carry-on bag at your feet because there's not enough room on the plane to bring it up to your lap. These are exactly the conditions that the Fueltank is useful for, and it falls down badly because of this nasty little cable that solves nobody's problems. The only good thing that I can say about it is that at least it's so short (3.25", 82mm) that it can't tangle up, and doesn't stick out when I strap it to the side of the Fueltank. I keep it there with a velcro cable organizer because if I lose it, the Fueltank is useless until I get a replacement mailed to me - exactly what I want in a travel-ready emergency backup. I mentioned previously that the Fueltank Uno comes with two adapters: the mini-USB and one for Apple's iPod variants, such as the Mini, Classic, and Telephone. It also includes a voucher for a 'free' (read: cost built into purchase price) adapter cable just in case your device needs a different connection. 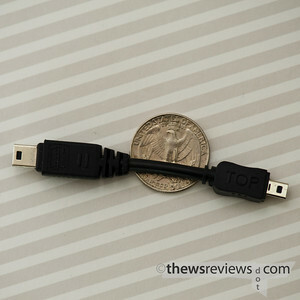 The Palm Pre that Penny uses has the industry-standard micro-USB charging connection, so that's the one that I ordered. 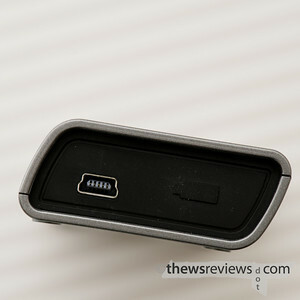 If I had done more research, I would have seen that Callpod does offer a female USB-A adapter - search for style USBA-0001 - that would make the Fuelcell compatible with any standard cable. If nothing else, it proves that there's no practical reason not to have just included the female USB-A port right in the battery pack from the very beginning. That only leaves a non-engineering, non customer-service reason: the absolutely massive profit margins on cables. 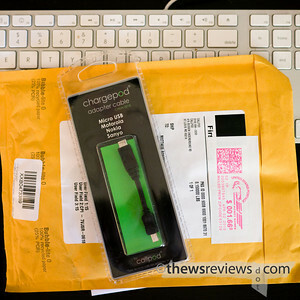 Callpod sells their custom cables for $10 without needing to discount for wholesalers, and if it costs them more than a dollar each, I'd be staggered. Fortunately, Callpod includes 'free' USPS International mail for customers who are redeeming a voucher. And it seems like I've finally found a company likes dealing with UPS even less than I do. For the Worldwide Expedited service, which is one of the 'service levels' that includes the massive hidden fees, they want $114.13. That's not a typo - or at least, not my typo - they want ONE HUNDRED and fourteen dollars. To put that in perspective, B&H Photo will ship me a Nikon D3x and 70-200/2.8 mkII, ten thousand dollars worth of heavy camera gear, for an even hundred via the same service. But at least Callpod's UPS prices aren't completely out of whack, since their charge for sending an envelope through the "UPS Express Saver" service is $122.48, which aligns to the $114.75 that shipping my dream camera system would cost. For buying a Callpod cable outright, their cheapest shipping option remains USPS International, but at the time of writing it costs $6.66. And yes, I have a screenshot of that, too. I couldn't make this stuff up if I tried. There are several things that I consider when I choose a rating. If I like something enough that I can't stop talking about it when someone asks, that's worth a '3'. If I dislike something enough to rant about it when someone asks, that's a '1'. That combination is where I find myself with the Callpod Fueltank Uno: it's a great idea, the product does exactly what it says, and it works for what I want it for. It has some strong features, including a good power reserve at a reasonable size. At the same time, the need to use a badly designed custom and hard-to-get cable ranges from a mild but ongoing nuisance to a critical failure that leaves the Fueltank unusable. I'm happy to have it, but if mine gets lost or stolen tomorrow, I wouldn't buy another one without taking a long, hard look at my other options.